Choosing the best pet playpen (often referred to as exercise pens for dogs ) might not be the same for every breed. See our top picks and you will find right x-pen for your puppy in no time! Is your pooch prone to destroying your carefully manicured landscaping? Does he always create all sorts of problems in your yard? Consider getting an enclosure for him – it will allow you to confine the pet to a specific area while still allowing him to enjoy some outdoor time. A quality dog playpen is one of the best outdoor ways for confining, training or protecting your dog. Furthermore, it allows an owner to leave his four-legged friend in an area that removes the need for supervision and gives him the necessary peace of mind. It’s one of the most useful tools for raising a well-behaved puppy, and a fantastic alternative to an invisible dog fence if you’re not sure about using one. If you’ve already set your mind on purchasing an ex-pen, you’re probably confused by a large number of various brands available on today’s market. There are dozens and dozens of different models, each of them sporting a specific set of features and benefits. To make things easier, we’ve decided to round up the most popular brands and their products and a closer look at their features. Our short but informative reviews are guaranteed to assist you in choosing a perfect playpen for your pup – read on! With each of its panels measuring 40″ x 31″, Safstar Heavy Duty comes in sleek black color and consists of eight panels. Just like we expected, the package also includes eight ground stakes which you can use to secure the enclosure in place, as well as the well-written instructions. Besides the fact that it can be used with large breeds, the main selling point of this product is its remarkable flexibility. With this model, you will be able to connect multiple panels into any shape you want – octagon, rectangle, square, and others. This kind of modularity can come in very handy in certain situations and is a feature that deserves special praise. Setting up and breaking down the whole thing is exceptionally easy. One panel serves as the door (with a hinge), and the entire playpen takes up approximately 27 square feet when it’s set up in a rectangle shape. Of course, one can also purchase several Safstar products and enlarge the covered area even further and play with their favorite toys such as ball throwers. The construction quality is outstanding, too – the fence looks and feels very sturdy, and can easily withstand all kinds of wear and tear. The primary build material here is solid iron, covered with an ultra-durable epoxy coating – the whole thing very stable and secure. One thing we really liked is that has smooth edges, removing the need to worry about accidental injuries for you or your pet. Since it is super easy to assemble and use it, we can’t do anything else but recommend it to our readers. It’s one of the best products of this type for the owners of large dogs – it keeps them safe and secure. This versatile, heavy-duty x pen can be used both indoors and outdoors – no matter where you decide to put it, it will keep your pet confined with its sufficient height of 40″. If you’d like to know more about it, read on – we’ll analyze its features and try to find its value for the money. First and foremost, this model simply gets the job done. It’s a sturdy piece of pet equipment that looks and works just as advertised, and that’s always a huge plus in our book. Whether you own a small or a large canine, this model should successfully keep him within the designated area. Assembling and disassembling is a breeze, turning the whole process of setting it up and breaking it down into a hassle-free job. No tools are needed, and storing the model away is exceptionally easy due to its collapsible design. We also liked the fact that is very flexible since it can be configured in a way that suits your needs the best. It consists of eight panes, and these can be used to create a plethora of different shapes. This allows the pet owner to create a form that fits the space at his disposal or even to block off the desired area with a fewer number of panels. The fact that the frame hinges can be anchored into ground make this model perfect for outdoor use. The hinges will hold firmly in its position, and won’t allow the pup to move the fence while he’s playing. When it comes to downsides, our only complaint is that the iron isn’t coated with an anti-corrosion coat. This can lead to rust, and therefore to an unattractive look and possible problems with opening and closing the door. For the pet owners looking for a versatile but affordable product, the BestPet’s model is a good option. Its flexibility allows it to get the job done in a variety of settings, both indoors and outdoors. We recommend it! MidWest Homes for Pets is undoubtedly one of America’s most famous manufacturers of pet equipment – their products are still distinguished by innovative construction and design. For that matter, we’ve decided to take a look at their attempt to create the market’s best playpen for dogs – the Foldable Exercise Pen. One of the first things to notice about this model is its look. It can be bought in two different colors – black and gold zinc, and each version sports an E-coating whose job is to protect the material from corrosion. The fact that this product was made to last is evident right from the start, and that’s always a big plus in our book. Furthermore, the product can also be purchased in several different sizes (up to 48″ of height) and is capable of covering the maximum 16 feet of area. In the 48″ version, each panel measures 24″ x 48″, and that’s guaranteed to prevent your four-legged friend from making an easy escape. Setting up and taking down this foldable model is incredibly easy. No special tools are required, as you will be getting all that you need right in the package – 4 thumb-snaps and eight ground anchors. As you can already guess, the ground anchors allow one to use this x pen for dogs outdoors. Once it’s anchored, it firmly stays in place and stops even the most active pets from leaving the designated area. Other things worth mentioning is that it comes with a 1-year limited warranty and that one can buy several different accessories for it, such as the sunscreen top and the wire top. When it comes to disadvantages, the only thing we didn’t like is the flimsiness of the included locking clips. They’re not very well-made and could quickly become your pup’s new chewing toy. Overall, we think that this model has a pretty good value for the money. It’s one of the best choices for large dogs on the market, especially if you intend to use it outdoors. Like we already mentioned, this entire model is made out of plastic. It’s not any kind of plastic, mind you – it’s the most durable kind that’s very resistant to chewing and scratching. As long as your pooch is appropriately sized for this pen, you won’t have to worry about any severe damage. Upon getting this product, the first thing we had to do is to assemble it. The whole process was exceptionally easy since the screwdriver was the only tool we needed. It consists of eight separate panels that have rubber footings on their bottom parts, and are, therefore, absolutely suitable for indoor use. Just like we expected, one door had a hinged access door, featuring double-steel hardware. Once it’s assembled, the IRIS Playpen covers 21 square inches of space, which should be more than enough for your canine companion to get some exercise and play around. The panels can be positioned in a variety of different shapes, allowing the users to make the most out of the available space. It is suitable for most dog breeds, especially the small and medium ones. One thing we particularly liked is that it can be purchased in nine different colors. This will allow you to easily match the color of the puppy pen with that of your interior – a degree of user customization is always a welcomed feat. The only downside is that isn’t as sturdy as the metal-made models – it’s more of an indoor dog pen for smaller breeds. In conclusion, we think that this is your best choice if you own a small dog and live in an apartment. It won’t damage your floors and will keep your dog safely contained within the designated space. When buying this model, you will encounter three different options – a 4-Panel, 4-Panel 36″ Height, and a 6-Panel 36″ Height. No matter which option you choose in the end, you’ll end up with a model that can be used in three different ways, and those are as a playpen, as a dog gate, and as a room divider. A vast majority of pooch owners will surely appreciate the vertical direction of the model’s panels since they can effortlessly prevent active dogs from making their escape. In our opinion, getting the version with six panels is of paramount importance. Unlike the 4-panel versions, the Richell Convertible High with six boards will let you orient the whole thing in a hexagonal shape. Unlike the rectangular one, the hexagonal orientation will provide your pet with a circular perimeter, and therefore with more space to move around. The entire thing has been manufactured from thick, durable plastic, making it more suitable for indoor use. Using it inside the house can be especially convenient when you consider buying some of the official add-ons for this model, like, for example, the pet comfort mat. However, using it outdoors is not something you’ll regret – it is very sturdy and features a smart design that stops dogs from climbing out. When it comes to disadvantages, the biggest one is the price. If you’re looking for a budget-friendly pen, you’ll have to look elsewhere. With Richell Convertible High, the possibilities are endless – it is one of the most versatile playpens we’ve tested so far. If you’re not on a tight budget, definitely consider this model for purchase. 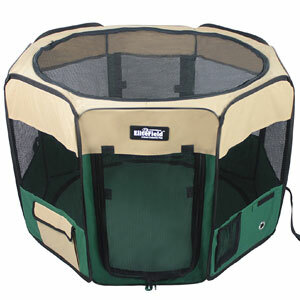 Keeping your canine safe and sound isn’t such a hard task when you have a quality playpen. EliteField’s new product seems to be a good contender for the place of the price/value champion – it’s affordable, versatile, and offers plenty of ventilation. Let’s take a look at it! This model is one of only two products on our list that don’t sport a metal/plastic construction. Instead, this product uses an easy-to-wash and breathable fabric as its primary build material. It can be purchased in nine different color combinations, all of them looking pretty sleek and impressive. We tested the 48″ x 48″ x 32″ model (one of several available sizes), which is a bit higher than the other soft dog playpens on the market and thus offers more play area to the pet. Due to its polyester fabric construction, some people might think that is an indoors-only model, and they would be wrong. It comes with three ground stakes that allow the owner to easily set it up in the backyard. There are two doors, each of them having locking zippers which, although a bit flimsy, successfully provide the necessary safety and security. Due to its hex mesh walls, the EliteField 2-Door offers plenty of ventilation, while the extra accessory pockets provide the pet owner with a place to store the necessities, such as the water bottles. Both the top cover and the floor mat are removable and machine-washable, and the whole thing can be easily folded down and stored away. The only thing we didn’t like about this one is the quality of its zippers. They’re quite flimsy and in sharp contrast with the overall quality. As far as we’re concerned, this model effortlessly proves that a dog playpen doesn’t always have to be made out of metal or plastic. The soft material of EliteField 2-Door makes it easy to transport and store away, turning it into an excellent choice for the pet owners who travel a lot. The superior design is apparent right from the start – the model sports a beautiful combination of green and black colors. It can be purchased in two different sizes, which are “Large” (36″ x 36″ x 23″) and “Medium” (29″ x 29″ x 17″). We tested the “Medium” variant, with the size being the only difference between the two versions. Since it is made out of 600D nylon, the product is extremely lightweight and portable. Moving and storing is a breeze, and that’s a feature that will come in very handy to traveling dog owners. The nylon used for its construction is undoubtedly durable enough for most people’s needs. Furthermore, it is water-resistant and very easy to keep clean. The Unleashed Portable Foldable is a very roomy playpen, offering a lot of space to the pet and having mesh walls that provide a lot of ventilation. When it comes to accessibility, there’s a zippered door on the side and a removable zippered top. The fact that the model doesn’t require any assembly is yet another plus. One thing we particularly liked about Unleashed Portable Foldable is that it comes with two useful accessories. Along with the playpen, you’ll also get a bonus carrying case (with a convenient handle) and a collapsible travel bowl. Pretty impressive, wouldn’t you say? Our only complaint is the strong chemical smell that the product emits upon unpacking. It goes away after a couple of days, but could still make some people worried. We can finally see why the people are so enthusiastic about this model. For a low sum of money, you get a playpen that’s very durable, highly portable, and even includes a carrying case and a travel bowl. What more could one want? Are Playpens Good for Dogs? Instead of this, you should provide your new four-legged friend with a safe place right from the beginning. This will enable him to make a more gradual transition to a new home, and allow your furniture and carpets to stay intact. Of course, it will take a couple of weeks for the pet to get used to it, but patience is well worth the trouble in this case. It will keep the pup safely confined, but it won’t restrict his movement too much. It creates a line-of-sight contact between the owner and the animal throughout the day. It provides the pet with a chance for exercise, snacks, and play in a secure area. Most of them are sufficiently durable to withstand things like chewing and teething. Finally, cleaning and maintaining are very easy. In an ideal kind of situation, a playpen will also be travel-friendly, giving the puppy a familiar space to play in no matter where he is at the moment. As we already said, it is an excellent solution when an owner can’t provide 100% supervision but still wants to give his pooch with a bigger play area than the dog crate can provide him with. In case you’re busy with something else or have to leave the house, a quality pet playpen will be there to prevent things like chewing or potty accidents. It’s one of the best options when it comes to house-training. People often provide their pups with complete freedom right from the start, which, in our opinion, isn’t a good idea. Once the chewing or potty accident takes place, these owners confine their pups, turning the confinement into a sort of punishment. One of the most significant benefits of these products is that they’re modular – the user can change the size of the pup’s confinement area in any way he wants. Furthermore, it provides a lot more space for food, water, and toys, as well as for playing. However, they’re not the best choice when it comes to housebreaking the dog, and some models have low walls that the larger pet can jump over. 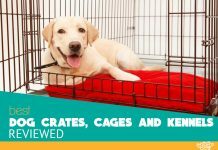 A quality heavy duty crate can easily become your pet’s safe space – it is small and protective, serving as a safe haven in times of fear and anxiety. Due to its size, it’s a perfect solution for the dog owners that do a lot of traveling. On the other hand, some dogs might also see their new crate as a punishment, and training them to like it can be a frustrating and lengthy process. So, Which One it is? There is no clear answer to this question. A lot of factors are in the play here – such as the dog’s age, personality, training level, as well as the owner’s needs and the available space within the house. Try to find out which option works the best for your four-legged companion and your own lifestyle, and only then make the decision. Size should be your first consideration. Even though a large model can provide your pooch with plenty of room for playing, it is vital to select a playpen that will fit correctly in a yard or a room. Before shopping, make sure to take some measurements and choose your product accordingly. An important thing to keep in mind here is that some models come in detachable segments – these can be oriented in a wide array of ways and thus save you some space. You will be able to decrease the model’s size by altering its form (from hexagonal to rectangular shape, for example). See The Ultimate Guide for Crate Size. You will also have to consider the height. Models that are only a couple feet high will be suitable for puppies, but not for the large breeds – they could easily jump out. If you own a large dog, look for models with high walls or those with detachable top covers. A vast majority of the currently available models are made from the following three materials – mesh, metal, and plastic. Plastic models are suitable for indoor and outdoor use and also come at a reasonable price. They’re lightweight, less likely to scratch your floor, and they don’t have as many sharp ends as their metal cousins. However, they’re not suitable for canines that chew a lot – they might find a way out of them over the time. Metal models are more expensive, but also far more durable and sturdier. They cannot be chewed through, and the dogs can’t lift or push them easily. On the other hand, they’re also harder to transport and can damage your floor when used indoors. Mesh pens are the most affordable option out of the three. They are very comfortable, portable, and easy to store away, but you shouldn’t buy one if your dog is an excessive chewer. As you can already guess, heavier models are much harder to move and are therefore suitable for very energetic dogs. However, unlike with the lightweight mesh models, you’ll find that bringing one with you to the park for a picnic with your dog isn’t that easy. Make sure to get one with a roof if your dog is prone to frequent vertical movement. A roof can also protect your puppy from native fauna, such as hawks and owls. If you’re planning to use it in the yard, try to find a model with an anchoring system (ground stakes). An indoor model, on the other hand, should have rubber footings that prevent damage to your flooring. As we said, mesh models are the least expensive, while the metal ones are the priciest. Plastic products are somewhere in the middle, offering the best balance of the price. Try not to go too cheap and end up with a model that your dog will escape from the same day you buy it. Dogs are the most loyal companions – they offer us their unconditional love on a daily basis. For that matter, it is our responsibility to provide them with a happy life. We can do this by giving them love, food, shelter, and safety. And when it comes to safety, it is of crucial importance to select the right playpen that will assist you with training and safeguarding your four-legged friend. Since there are so many different brands on the market, we picked up the most popular ones and thoroughly tested their durability, design, construction quality, and value for the price. Our short but informative reviews should help you find a model that suits your beloved pooch the best. Choosing the winner isn’t such an easy task here, as each product comes with a specific set of features that separates it from the competition. Our favorite metal model is the Safstar Heavy Duty, as it’s highly modular and has a very sturdy construction. Richell Convertible High wins the category of plastic playpens due to its convertible nature and the thick plastic build, while the Unleashed Portable Foldable stands as our favorite mesh playpen due to its great price and excellent design. We hope we’ve been helpful – now it’s up to you to choose a model that will keep your pooch safe and secure for the years to come.